2019 Grammys: Who Is H.E.R.? Though the Grammys are not typically known for making exciting, forward-thinking choices in nominations, one name stood among the bunch this year as a step in the right direction: H.E.R. A relative unknown to anyone who doesn’t spend hours lost down SoundCloud rabbit holes, the intentionally elusive R&B singer stunned by getting five nominations, including Album of the Year for her debut album, a collection of songs that mostly appeared on SoundCloud. She’s also up for Best New Artist and has a real shot at pulling off an Esperanza Spalding–esque upset. Unfamiliar with her music? Not to worry. Here are some fast facts to get you primed before H.E.R. becomes too big to not know. She used to be anonymous. 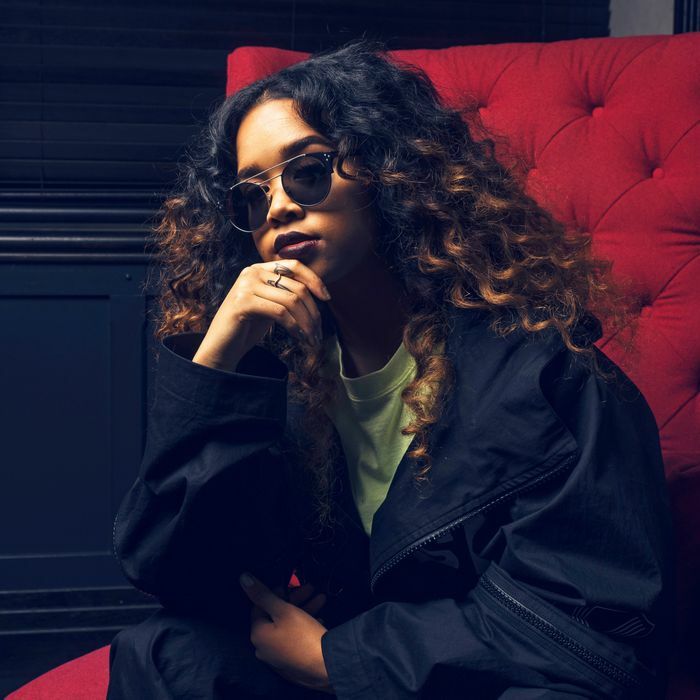 Chatter about H.E.R., like most new artists of the internet age, first started on SoundCloud. Though she initially uploaded to the streaming platform under her real name, Gabriella “Gabi” Wilson, at some point in 2015, she invented a new persona and began uploading under the gender-specific but otherwise intentionally ambiguous new moniker H.E.R. In the process, she even attempted to erase any online footprint that might be traced back to her real identity. Naturally, fans blew her cover when they found her 2015 cover of Drake’s “Jungle” associated with her old account. She later released the song as part of the H.E.R. Volume 1 EP in 2016. At the time, H.E.R. was already signed to RCA and began doing press under the condition that it be anonymous, from her name to even what she looks like. (That meant no press photos — just the music.) “The mystery is a metaphor for who I am, or who I was at the time of creating the project,” she told the L.A. Times in late 2016 for her first interview. She later told Rolling Stone, “This project came from an emotion, and that’s what I want it to be about — not what I look like or who I’m with, but the raw emotion and support for women.” She also said it was in reaction to artists oversaturating pop culture with too much personal detail. “I feel like this is the era of the anti-star,” the musician says. “I really just wanted it to be about the music, and get away from, ‘Who is she with?’ and ‘What is she wearing?’” she told NPR. Yes, H.E.R. is an acronym. In that same interview, it was revealed that H.E.R. isn’t just a vague pronoun but actually stands for Having Everything Revealed. “It’s kind of ironic, right?” she told the L.A. Times. She came up with the name in the studio while writing through a breakup. “I remember saying I’ll never be that girl, I’ll never be that girl that falls for the wrong guy. I was constantly criticizing that girl and eventually I found myself being that girl, being her,” she explained. But before she was H.E.R., Gabi Wilson was a child star. RCA signed Wilson when she was 14, and she went on to do TV spots on Maury and the View, as well as sing at the Apollo when she was still just 10. (You’ll notice that her specialty was Alicia Keys covers on the piano.) In 2014, she put out her debut single, the Biggie-sampling “Something to Prove”; it’s the only song she’s ever released under her real name. Rihanna helped her blow up. Social media does a lot of the work of music discovery these days, particularly when the account belongs to someone with superior taste. Enter Rihanna. For what can best be described as an Instagram flex, Rih soundtracked a video of her hair blowing in slow motion to H.E.R.’s debut single “Focus.” The combination was hypnotic and racked up 5 million views plus tons of attention for H.E.R. H.E.R. further caught on when she collaborated with fellow SoundCloud R&B star Daniel Caesar on their duet “Best Part,” then linked up with Bryson Tiller. She finally revealed herself — sort of. By summer 2017, H.E.R. couldn’t stay in hiding and finally showed her face during an in-person interview with the L.A. Times — having put out a second volume of her EP series — though she didn’t yet confirm that H.E.R. and Gabi Wilson were indeed the same person. Slowly but surely, she let fans connect the dots. “It hasn’t even been a year and everything is happening so fast. It was almost like I was forced to reveal myself — like, ‘OK, it’s time,’” she added. In August 2018, she provided more detail to WWD: Wilson, 21, grew up in San Francisco, is half-black and half-Filipino, and has acting aspirations. Preserving at least some of the mystique, though, she keeps her sunglasses on during all appearances. In addition to her honeyed vocals and soul-baring songwriting, H.E.R.’s next best-selling point is that she’s a multi-instrumentalist who can play piano, bass, drums, and guitar. Especially the guitar. If you haven’t seen her 2018 BET Awards performance, where she showed the latter off, what are you waiting for?